Is a reservation required for court usage? Yes, we highly recommend making a court reservation in advance. Simply call the Tennis Pro Shop, our direct number is (808) 821-8225. Or call extension 8225 from your room. Is there a fee for court usage? 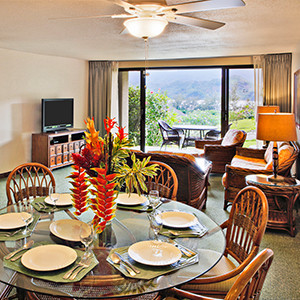 There is not a fee if you are staying at Hanalei Bay Resort, your court time is always complimentary. If you are not staying at the resort, we absolutely welcome you to join us. Court fees will apply on a per person per day basis or consider becoming a member here as we do offer short term memberships. Please contact us for your best options. Is there a fee for equipment rentals? Tennis rackets are available to rent for the day. Adult rackets are $10 per day, junior rackets $5 per day. You may borrow a sleeve of used tennis balls at no extra charge or purchase a new can of Wilson US Open balls for $5. Guests are also welcome to bring their own equipment. What type of court surfaces does Hanalei Bay Resort offer? We have a total of eight courts in a unparalleled scenic setting. All eight courts have been recently re-surfaced and are maintained daily. Four courts are Nova Pro synthetic grass which offers players the comfort of a softer court. The other four courts are the traditional hard courts with the US Open blue and green acrylic surface. Are towels offered to players? Yes, fresh towels are available, both fresh dry towels and scented cold towels to refresh after playing. Is water available when playing? Yes, there is water available in the tennis pro shop for purchase and complimentary fresh ice cold water and cups are supplied for every court. Yes, proper tennis attire and proper tennis shoes are required. Do you offer private and/or group lessons? Yes, private and group lessons can be scheduled 7 days a week from 8:00am – 6:00 pm.